In the winters, the sidewalks here are liberally salted to melt ice and snow. It’s really bad for dogs, and can start to burn their paws very quickly. Hershey would either stop completely in his tracks and refuse to walk, or walk on three legs to avoid the pain. Hubs and I had to do something. After a little searching, I bought two kinds of booties during my short visit to the US in January. The ones pictured have given us the most success. They’re like tiny rubber balloons, but thicker material. They’re moderately difficult to put on his feet, but they don’t slip off; and he can’t pull them off. He hates getting them put on and sometimes gnaws Hubs’ hands (lightly) when he’s putting them on him. Once they’re on, it’s no problem. He prances around like normal, because he knows it’s time to “go outside”. 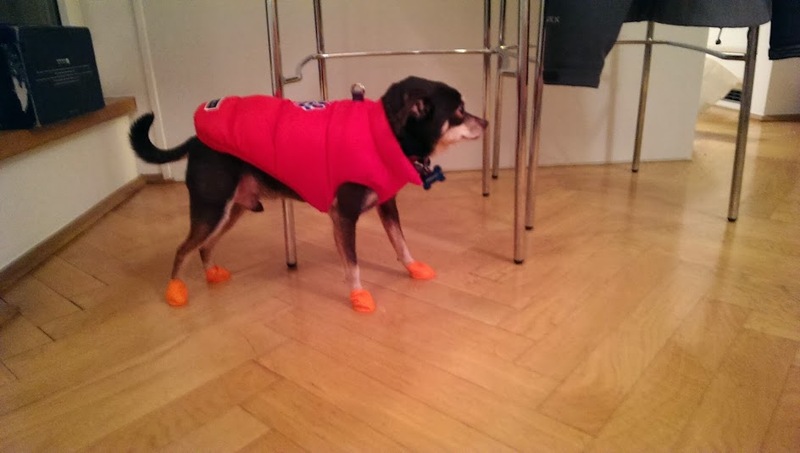 Hubs felt silly walking a dog with bright orange shoes, at first. However, we immediately knew they were the answer to the salted sidewalks. He walked like a normal, happy dog that he is. As a side benefit, they have attracted a lot of attention. Typically, Viennese people keep to themselves and are very reserved. They cannot resist, however, a dog wearing something out of the ordinary. Hubs has been asked by several other dog owners whether the paw covers work, and where to get them. They have enabled us to get to know other dog owners in our neighborhood. Apparently, most dogs owners know each other and their dogs too. We’ll take any conversation that we can to get to know the locals. It’s difficult to break down that barrier, unless you have something in common to talk about.